If you have been trying to follow this blog for a while, you will notice one thing rather quickly. It’s not that I don’t have anything to say, far from it, it’s just trying to get into a routine of writing about art again is rather difficult. If the only deadlines you have are self-imposed, and your boss is descended from a long line of procrastinators, the results are well, what you see don’t see here. Which is why I have decided on a whole new content add-on, in order to give you guys something to read besides a three month old post, and, more importantly, to get this blog back on track and focusing on what’s important: art forgeries. So, starting this week I am now offering FAMOUS FAKE FRIDAYS! Every week, I will post about a famous (or even infamous) fake from history for your edifying pleasure. It only seems fitting then, to begin this tradition with the forgery that started my passion for the study of art forgeries. 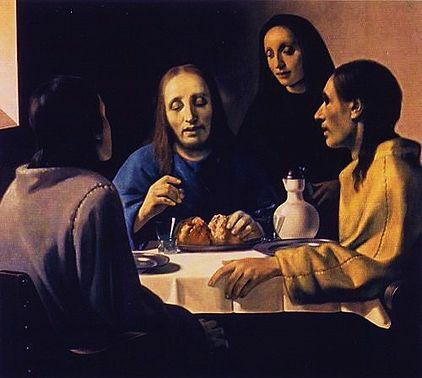 I give you… Hans van Meegeren’s notorious Supper at Emmaus. Now, this was by no means his first forgery, but it is certainly one of his most famous, and the one that he probably worked on the longest. It was also (crucially) done with one particular art historian in mind, Abraham Bredius. He was absolutely convinced that the famous Dutch painter Johannes Vermeer must have been influenced by Italiannate painting, and in particular by Caravaggio, and that Vermeer may even had spent time in Italy in his early life. Bredius was nearing the end of his career, and had yet to prove his theory about Vermeer’s schooling, which is where Van Meegeren comes in. He deliberately chose a religious painting by Caravaggio, Supper at Emmaus, as the original inspiration of the work, and spent years perfecting his recipes of traditional pigments and Bakelite to create the hardened surface of a three hundred year old oil painting. Bredius was hooked, and even wrote an article describing his discovery of this new “Vermeer”. Later on of course the forgery was unmasked, and Bredius’ reputation was tainted. I actually got to see this forgery in the Museum Boijmans van Beuningen in Rotterdam, relegated to a nondescript hallway on the back of the museum, a far cry from its original prominence during the late 1930s. P.S. Can anyone spot what’s wrong with this picture?